This is the eighth of ten Blog posts I’m devoting to counting down The Top 10 Alive with Clive Highlights of 2011. In this Blog post, I discuss Highlight # 3 – The Creation of The Alive with Clive 55! I launched The Alive with Clive 55 on December 21, 2011, to commemorate my 55th birthday. You can read about the events leading up to the launch of The Alive with Clive 55 in the Blog post I published about it on December 21, 2011, when you click here. 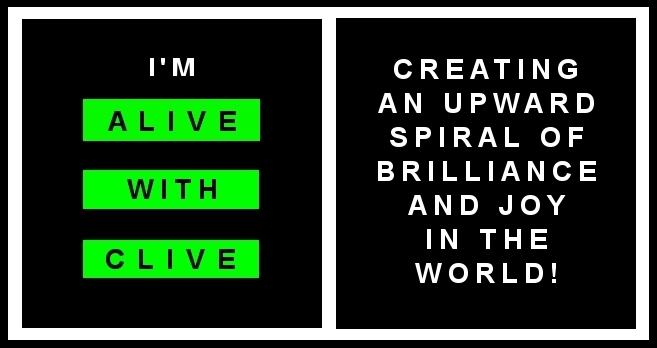 When it was first launched, The Alive with Clive 55 was open to anyone who was willing to invest $55 to become a Gold Member of The Alive with Clive Global Community. The Alive with Clive 55 is now no longer open to anyone. It is now possible to gain admission into The Alive with Clive 55 only as a Gold Member of The Alive with Clive Global Community by invitation or through the submission of an application, and a few of the slots are being reserved to enable me to promote businesses as a compensated affiliate. If you (or a business or charity you represent) want to become a member of The Alive with Clive 55 now, you must first become a Gold Member of The Alive with Clive Global Community for $97 and then submit an application, unless you receive an invitation directly from me. To become a Gold Member of The Alive with Clive Global Community so you are eligible to receive an invitation or submit an application for inclusion in The Alive with Clive 55, click here to register for free as a Bronze Member of, or log into, The Alive with Clive Global Community, and then submit your payment of $97 to upgrade to a Gold Member. To request an application, send an email to clive at alivewithclive.tv (use the @ sign instead of the word at) with the words “Application to join The Alive with Clive 55” on the subject line. If you have received an invitation to join The Alive with Clive 55, you are on the short list of people who are being invited to join The Alive with Clive 55 before membership is offered to a much larger group of potential applicants. You are also being given the opportunity to become a member of The Alive with Clive 55 for the ridiculously low investment of just $155 now. The price of $155, however, will be in effect only for a short period before it goes up to $255. Now that I have cleared the way to once again focus on accomplishing my goal of raising at least a billion dollars for people affected by HIV/AIDS in South Africa, I am about to embark on a major campaign that is likely to cause thousands of people to visit my Web sites and become acquainted with The Alive with Clive 55 on a weekly basis. Members of The Alive with Clive 55 thus stand to benefit a great deal from all my promotional efforts, and the financial and other advantages of being a member of The Alive with Clive 55 are destined to be substantial. Membership in The Alive with Clive 55 will last until the later of July 31, 2013, or the end of the twelve-month period commencing from the time all 55 slots in The Alive with Clive 55 have been filled. Thereafter, it will be necessary for membership in The Alive with Clive 55 to be renewed for an amount and period that will be specified when it is time to renew membership. Stay tuned for more information about The Alive with Clive 55! This entry was posted in Alive with Clive and tagged Gold Member, The Alive with Clive 55, The Alive with Clive Global Community, The Top 10 Alive with Clive Highlights of 2011. Bookmark the permalink.